When we were discharged from the NICU, we were told to expect weekly ROP appointments until Jax was 70 weeks gestation. 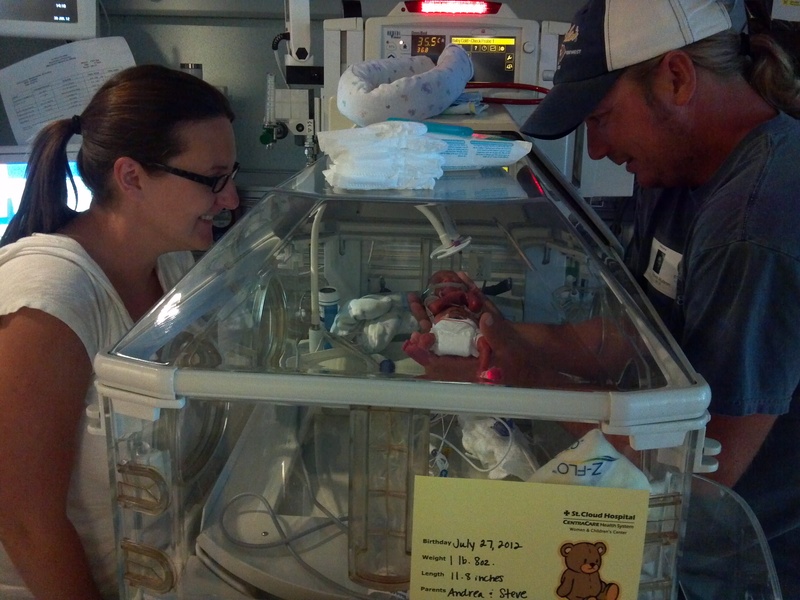 Jax was released when he was 36 weeks gestation. So, we were expecting about 8.5 months of weekly follow up appointments. They even made us sign a paper promising to take Jax to all of these appointments. ROP is invisible to you and me; there are no outward warning signs. Unfortunately in many cases, the ROP often advances and the child becomes blind. We weren’t willing to risk that, so we were prepared for this intensive appointment schedule. We are very thankful that the Avastin injections and the laser surgery have slowed the ROP so that the appointments have been monthly instead of weekly. We can’t complain (too much). Did you know that Stevie Wonder was a preemie with ROP? Back in the 1950’s when he was born, doctor’s were just realizing that oxygen was a way to save premature babies. However, they did not know, yet, that high amounts of oxygen could cause the vessels in the eyes to grow irregularly. Premature babies, especially those with very low birth weights, are born with eye vessels that are immature and do not reach the outer parts of the eyes. When a high level of oxygen is introduced, it interrupts the growth of the vessels and voila – you have Retinopathy of Prematurity. Stevie Wonder was born with sight, but because he received an excessive amount of oxygen, he developed ROP, his retinas detached and he became blind. Thankfully, doctors now are very aware of the connection between high levels of oxygen and ROP. Jax was on a ventilator for 34 days, SiPap and CPAP for 16 days, high-flow oxygen for 13 days, and low-flow oxygen for 71 days. Now – that’s a lot of oxygen! Thankfully, doctors were vigilant about using the lowest level of oxygen possible to keep Jax breathing and saturating at appropriate levels. But. During the first 34 days on the ventilator, Jax needed very high levels of oxygen to keep him alive, which is what caused his aggressive and severe ROP. Babies with severe ROP requiring treatment, like Jax, are at greater risk for strabismus, glaucoma, cataracts and shortsightedness (myopia) later in life, so we know we’ll have (at least) yearly follow-up appointments for the rest of Jax’s life. In the meantime, we’ll continue to be thankful that the treatments so far have saved his eye sight. Who knows, maybe Jax will become a great musician like Stevie Wonder and show the world again that preemies are tough little people that can overcome whatever is put in front of them. Here’s Jax’s version…which one do you like better? I’m Shayla I had ROP stage 3 plus I’m 26 was born at 27 weeks premature I was 1st baby of Alaska in 1989 have cryotherapy surgery work for the ROP it saved my vision, today I need glasses to see with about 20/50 with out plus I won’t be able to drive that’s ok at least god allowed me to see I sure and glad! Shayla – thank you for sharing your story! How cool that you were the first person to have the therapy in your state – you are a trailblazer! How old were you when you got your glasses? That has to be one of the cutest videos I have seen!!!! Jax really can belt out those lyrics!!! So sweet!!! I love following your blogs….they literally bring me to tears, every single one….as I can so relate traveling the same NICU journey with Dalton. Dalton received his Avastin injections from Dr. Hittner herself :), 2 weeks ago! So far so good, ROP is regressing. I will continue to pray for Jax and that his eyes continue to improve!! God Bless you all and hold you close!! Hi Kerri! I’m so glad the Avastin injections are working for Dalton. The technology and research that helps our little ones is amazing. I’m so glad you’re a part of our “family” here! Is Dalton still in the NICU? Attaboy, Jax. Just seeing him last week at your Dad’s Party was a blessing. You are all the right kind of family for that little guy. It was our pleasure to see him in person. God bless you all! It was wonderful seeing you and your niece at Dad’s party! Jax loves his new toy. 🙂 Thank you! Watched both videos. I must say little Jaxson sure gets excited when he sees his mom or dad. What a blessing for all three of you. God bless family and all the things you do for each other. Thank you so much! We love how interactive he is with us (and any person he sees)! His little laughs make our days brighter. I’m laughing because I didn’t know you were talking about the singer Stevie Wonder until the very end!! Go Jax!! Next Next post: “Graduation” Day!